The next version of Outlook, part of Office 15, is all about touch and unification with other Microsoft products including native Hotmail and social networking integration, a new feature called Peek, a Windows Phone-style “People” menu, and touch optimization. That’s my takeaway from Paul Thurrott’s look at the Outlook 15 preview, as part of the Windows-focused blogger’s sneak peek at the next version of Microsoft Office. While Outlook 15 is still a traditional desktop app, several changes appear to be preparing the way for users to access the program on a touch tablet. Office 15 is still in private beta and so there may still be some changes before Outlook 15 is ready for prime time, but here’s a look at some of the highlights. The next version of Outlook seems to have touch interface in mind. It looks like Microsoft is doing away with Outlook’s Social Connector add-on, first introduced in Outlook 2010, that let you integrate your Hotmail and social networking accounts, such as Facebook and LinkedIn. Instead, you’ll be able to add these accounts using the default configuration of the new Outlook. This makes a lot of sense, not only because it simplifies things, but it also brings Outlook 15 in line with Microsoft’s goals for Windows 8. The next version of Microsoft’s operating system aims to turn your PC into an even more integrated hub of your desktop and online computing life. Additions such as the Photos and People tiles in Windows 8’s Metro-style Start screen, for example, integrate information from your online Facebook, Flickr, and SkyDrive accounts. Peeking Into Outlook Thurrott also highlighted a new feature called “Peeks” that sounds like a catch-all term for several different features. If you send an e-mail in Outlook, for example, Peeks will include a People pane at the bottom of the window filled with information about the contact, including social networking information. That feature was available in previous versions of Outlook using the social connector add-on. 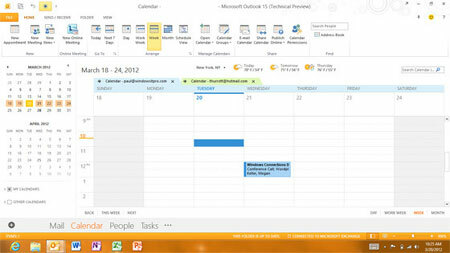 A new addition from Peeks is the ability to see a small window preview of different modules inside Outlook. Hovering over the calendar icon with a mouse, for example, will show you a preview of a calendar. This feature achieves basically the same thing as taskbar thumbnail previews Microsoft introduced in Windows 7. It’s not clear how, or whether, this feature would work on touch devices. Outlook doesn’t bother with pop-up windows anymore when you reply to an e-mail message, instead the reply pane appears inline. Thurrott says this is consistent with the Outlook Web App in Office 365, but it also sounds like another nod to touch devices where managing multiple windows can be a pain, especially if you’re dealing with a 10-inch tablet screen. Other features to look forward to in Outlook 15 include a new local Weather Bar for the Calendar view, and contacts has been renamed “People,” just like Windows Phone and the Windows 8 Start Screen. Just like the rest of Office 15, Microsoft has included a new touch mode that increases the size of menu items, making them easier to handle when navigating Outlook with your finger instead of a mouse.